Why use a standard wand when you can get a combination of powerful brush agitation and speed in a super lightweight attachment with wheels—all at a bargain price! So lightweight and maneuverable, the Powermate will triple your productivity. No more backaches and fatigue from slow, tedious cleaning with a wand. The Powermate attaches to any portable unit to remove deeply imbedded soil and grit at record speed! 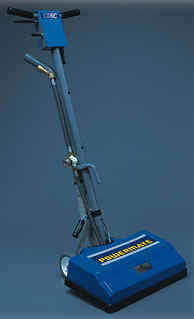 A high-speed cylindrical brush gets down to the base of the carpet fibers for more effective cleaning. Available with 1¼" (1202AC) or 1½" (1204AC) diameter handle. Choice of standard unit up to 100 PSI or high heat up to 300 PSI. Sealed, stainless steel ball bearings. High-speed 2500 RPM brush for deep cleaning. Adapts to all EDIC extractors. The ultimate in speed and power for a deep down clean! Powermate 1800AC attaches to any portable or truckmount extractor for cleaning tough, dirty high-traffic areas. 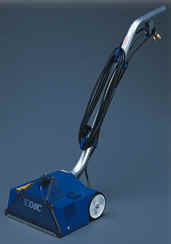 An 18" wide cleaning path and high-speed brush save valuable time and reduce operator fatigue. This power brush is designed to clean right up to baseboards and into corners. Its fully adjustable handle fits any size operator and the low profile makes it a breeze to get under furniture. High-speed chevron-style brush for deep cleaning. See-through sight glass to monitor recovery. Ship Dimensions 58" x 22" x 10"